What did you think of Les Contes d'Hoffmann? It may not be the pick of the litter of recent Hoffmann productions but still an enjoyable opening night thanks to some excellent singing. It certainly delivers on the alluring promise of lavish costumes and sumptuous melodies. Few would call Vittorio’s acting finely nuanced but there was a discernible difference between his portrayals of the hopeless/hapless romantics of Werther/Hoffmann which was pleasing to see, and his unflagging exuberance glued the whole thing together. A fun bit of escapism. Looking forward to the cinema broadcast. A production without a concept in sight and one that suggests that the director actually read the libretto and wanted to stage something that Offenbach and his librettist might recognise as their work. How terribly old fashioned and how enjoyable ! This is certainly the most enjoyable of the three operas staged so far this season and, on the basis of the rest of the productions that we are promised during the rest of 2016-17, likely to be one of the best of the entire season. As a production without a concept in sight or clever ideas which get in the way of enjoying the opera I can only assume that it is due for the chop. As far as the singers themselves are concerned what a pleasure to hear performers who are not hampered by the staging and who are really capable of delivering the goods rather than the bargain basement, sorry, "stars of the future " that we had to endure in Cosi. As I said before I can only assume that it will shortly be replaced by a more challenging,updated, accessible production which won't bear revival. An awkward and bland performance reminiscent of a pantomime, saved by a strong Grigolo as Hoffmann and by a robust, yet wasted, Kate Lindsey as Nicklausse. Grigolo was a strong Hoffmann, delivering the character of the drunken poet in the introduction in such a way that made a dramatic impact when seeing his stability in subsequent acts. Lindsey was a charming Nicklausse, and offered in her later impression of Olympia the best realisation of the mechanical doll of the evening. Sonya Yoncheva was an enjoyable Antonia, but the act as a whole lacked any dramatic or emotional weight to give her performance value. Christine Rice's Giulietta again, whilst good, was rendered forgettable by a bloated set and the seeming rush of the orchestra under the baton of Evelino Pido to get the charade over with. Sofia Fomina's dismal Olympia offered her best performance of the act during her deconstruction at the hands of Coppelius, played by the appropriately villainous and entertaining Thomas Hampson. Even so, his over-characterisation of the demonic Dr Miracle resulted in a half-expected call upon the audience to shout out 'He's behind you!'. The ROH's revival of Schlesinger's once-iconic production felt tired and lacked any sense of comedy or emotional nuance, or crucially, any of the bizarre whimsy which the opera -by simple virtue of its plot alone- can give. The sets creaked with age just as the actors groaned their way through with the undeniable boredom of a staid arrangement (however authentic) of Offenbach's glorious score. The prolonged silence between Act III and the Epilogue, in which the Barcarolle made a seemingly random return, did little to mask the crash of machinery as the stage turned around for the final scene, of which the 'drama' within could have been relayed as effectively as it was by the usher's on the way out. To the production's credit, they appear to have answered the dull argument of the correct ordering of the acts, revealing that their choice is exactly what not to do to make sense dramaturgically or musically - although thankfully the usual placement of Olympia's tale in Act I gave the greatest amount of time for the audience to forget the mechanical mishap that was Fomina. The Epilogue fell completely flat, punctuated by an overuse of spoken word and the rushed reveal of Nicklausse as Hoffmann's muse, replacing the more commonplace use of the finale chorus with an off-stage rendition of the student's earlier chant. The sudden and anticlimactic ending of the opera seemed even to take the lighting either by surprise or slumber, as Grigolo was left alone, kneeling uncomfortably, before the lights went finally out on this overblown 1980's piece of big hair and no substance. A 'belle nuit' it was not! We thoroughly enjoyed the evening. Excellent cast, great to see Vittorio in good form, but in particular it was a delight to see a meaningful production without machine-guns, tanks, projections and set in the right period. It was great to see this production again. It is probably the best production in the repertory now and as FLOSS has commented above the Director did actually read and follow the libretto. When will CG Management realise that this is what audiences want - they do not want productions that are total drivel. Full marks for the singing and conducting last night. In my view the only disappointment was Thomas Hampson who seemed to find the bass elements of the tessitura a struggle. I'm afraid this wasn't a patch on the dazzling Opera de Paris staging (even sans Kaufmann) Sad to hear the vocal decline of at least one of the principals. Pido is fine in bel canto but here was out of his depth and the orchestra rewarded him with thin, passionless playing A dispiriting evening. The old, hyper-realistic production is not the approach I would choose for this fantastical piece, but it is fun and beautiful. And less realistic than it appears, artfully conflating Hoffmann's time with Offenbach's. The 'Old German' garb of the students, the archaising fashions of Restoration Paris (which makes the waltz anachronistic), that hand-strengthening/hand-torturing device for which Spalanzani has surely nicked the patent from Robert Schumann, the timeless decadent hedonism of Venice (complete with Turkish water-pipe and Romantic wastrels using it), then the sudden bleakness of Bismarckian Munich - all are realised with wonderful attention to detail. Grigolo throws his all into this part. His voice is too light at times (sensibly, we only had one verse of Amis, l'amour tender et reveur - erreur!) but he makes up for it with committed acting, most of all as the alcohol-fuelled misfit of the Nuremberg scenes. And some of his swelling, ringing climaxes are thrilling. No human Olympia can be perfect - some day this part will be played by a robot. Yoncheva was the best of the sopranos. Kate Lindsey was by far the best of the women. Hampson disappointed, especially in Scintille, diamant, but he made up for it with his acting. Halfvarson and Yurchuk were the best among the cameo roles. I came thinking I prefer one soprano, not four, Munich before Venice and the septet as the climax of the epilogue. I would still prefer one soprano, but this production makes a convincing case for the sequence it adopts. And not just because the Munich act is by far the most successful piece of music-drama. This sequence shows us Hoffmann's (albeit somewhat crabwise) progression towards art and humanity, especially with the inclusion of Nicklausse's aria. It is right that Stella does not sing - the diva/virtuoso is the ultimate nineteenth-century fiction. Luther's tavern is the Dionysian underbelly of Nuremberg, but in the epilogue, a way opens for Hoffmann to ascend to Parnassus - or perhaps to the meadow by the Pegnitz. But does he go? The final image of Grigolo slumped over a table is ambiguous, a fitting close to a profoundly unsettling performance. What a refreshing change to have an opera set in the period in which it was written, and the singing was superb. Modern and innovative isn't always better. I globally spent a very exciting evening thanks to the fascinating performance of Grigolo, Yoncheva and Rice. 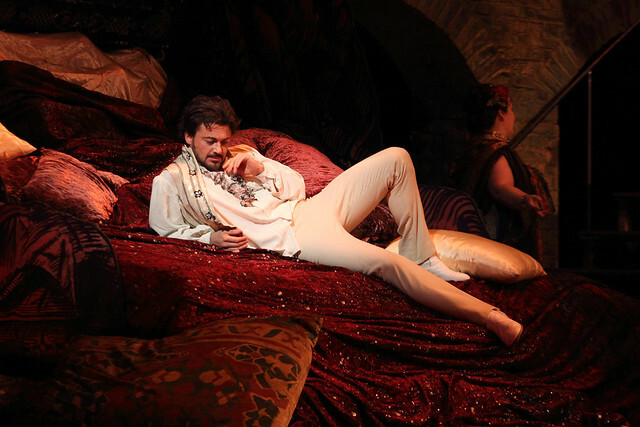 Grigolo deserves thousands of compliments for his excellent singing, his continous theatrical engagement and his perfect French diction and musical style (I am French, I know what I am talking about...). 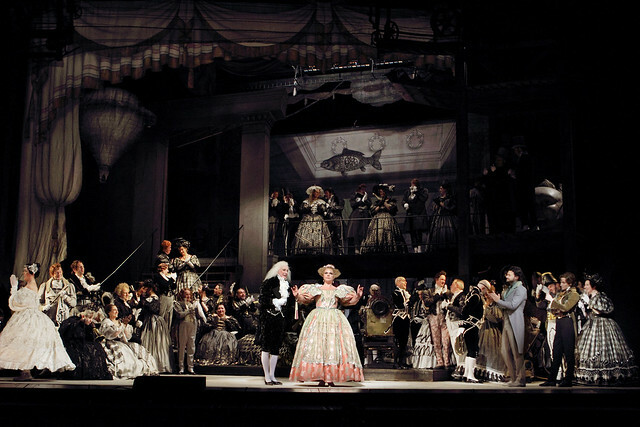 His Hoffmann is passionate, more in line with Domingo's interpretation than with the aristocratic approach of Gedda. Both approaches are interesting and Grigolo was absolutely convincing and exciting from the first to the last note of the score. Bravo!! Sonia Yoncheva renews the interpretation of Antonia: In the last scene she makes singing the way for freedom - hence death representing a kind of escape from the poor and boring life that Crespel is promising to her on Earth- instead of the traditional interpretation where singing is more a suffering and a malediction. That approach, totally innovative in the history of interpretations of Antonia, is very convincing and moving, and also beautifully sung, I loved it! Many small characters are outstandingly sung, thanks to excellent artists like Mortagne or Ordonneau. And the Chorus is in great shape! The production looks tired and visually too much old-fashioned, but it still works and it did not prevent me from spending a very good evening. Pappano did conduct it in 2008. I agree with Rupert Christiansen of the Telegraph. This production will be greatly missed. There are hardly any productions at ROH nowadays which offer such glamour and sumptuousness, a visual feast. V.Grigolo was splendid. Not only his voice is wonderful but he looks the part as well. Regrettably Thomas Hampson is past his prime. In 1980 John Schlesinger was already a legend as a film director having directed many famous films including Midnight Cowboy and Sunday Bloody Sunday when he turned his hand to opera and created this production. This is its eighth revival and, we are told, its last. Rehearsed by Daniel Dooner it is as grand and hansom as ever but also as cumbersome with its huge, elaborate sets taking ages to assemble, making for a long evening with two half-hour intervals. But it was well sung making the performance enjoyable. The production has seen many excellent tenors as the protagonist including Plácido Domingo, Alfredo Kraus, Marcelo Álvarez and Rolando Villazón. With such acts to follow Vittorio Grigòlo had a hard job but he pulled it off supremely. His acting is superb, both as the drunk in the tavern scenes and as the suave and debonair lover in the three tales. And his singing is strong and dramatic, a thrilling tenor voice that is worthy to be added to the illustrious list. As the four villains, Hoffman’s nemesis, Thomas Hampson seemed out of his depth. The role is for a bass-baritone and Hampson is a genuine baritone so the low parts were just too hard for him. And he sounded tired. I think he was miscast although he has sung the part at the Met. Hoffmann’s three lovers were well sung. Sofia Fomina delightfully had the metronomic jerks of the doll Olympia in both her body and her voice. Christine Rice was appropriately alluring and seductive as the courtesan Giulietta. As Antonia, Sonya Yoncheva gave an exciting performance which was a thrill to experience but she was not quite the little girl forbidden to sing. Perhaps the outstanding performance came from Kate Lindsey as the Muse of Poetry and Nicklausse. Hoffmann’s companion. She was a veritable alter ago to Hoffmann and sang with a sublime purity of tone. She was gorgeously comic when she imitated Olympia; the clicks, the jerks were outlandish. Evelino Pidò conducted routinely; the orchestra sounding quite mundane. Again, as is usual these days, the second and third acts were played in the wrong order. I know the end of the Antonia scene makes for a wonderful musical climax but dramatically it is rubbish. It is supposed to be a story about the degeneration of Hoffmann: The perfection of his first love, the doll Olympia; the human love of Antonia and then the pure lust for the prostitute Giuletta. Not a great performance but thoroughly enjoyable. I'm not sure there is a single "right" order for the three acts. As I said before, I came last week preferring the order he advocates, but I left thinking that this staging makes a convincing case for the order it adopts. Convincing, not definitive. I saw this production when it was new in 1980, it was and is one of the best ROH productions after the iconic Boheme also now removed from the repotoire. One of the best moments for me was the magical appearance of Dr. Miracle in the 3rd act. need more classic productions rather than some of these modern concept driven productions, and classic does not have to be traditional just good.